Pac-Man and Ghost were autonomous robots built from scratch and connected to a KIPR-Link controller/touch-screen interface. For this competition, both Pac-Man and Ghost had to successfully traverse any maze configuration within a given time limit. Ghost’s specific objective was to catch a Pac-man robot within the time constraint, whereas Pac-man’s goal was to find the end of the maze and avoid capture. While I had a hand in every part of the robot building process, by biggest contribution was in creating a color detection mechanism, which was implemented on the Ghost robot to hunt its Pac-Man prey. 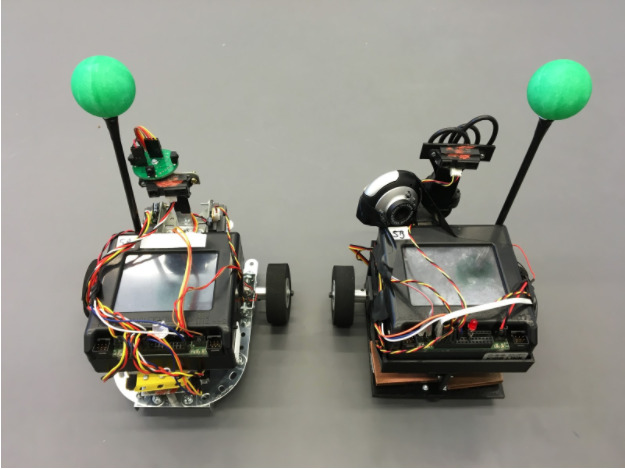 Using a camera, the robots adapted a field of vision similar to that of humans. Modeling our own perception, Ghost used the size of a green colored blob as a marker of distance. All Pac-Man robots were tagged with a green ping-pong ball to identify it. For Ghost, if the green blob size were small, the green ball would be further away. As the robot got closer, the blob would take up more of the robot’s field of vision and become larger. Ghost would move towards a spotted small green blob until the blob became large enough to meet a specific threshold. We decided to add a “pounce” function to move Ghost forward for 550ms after detecting a big enough green blob to give it a little push towards the required 6 inch capture position. This feature also gave Ghost a little anthropomorphized movement like a cat, because hey, robots are fun. Before the robot competition, most of my robotics experience lied only on the programming end. From this experience, I learned so much more about how to actually build the body of a robot as well as its “mind”. We had to consider everything, from materials for its structure to how it would move to what sensors to use in order to help it navigate a situated environment. 1. Our Pac-Man and Ghost robots had the smoothest movement of all the robots in the competition. Using mounted infrared sensors and a proportional-derivative control algorithm; the robots could run effortlessly parallel to maze walls, staying centered between corridors. 2. Since the final maze configuration for the competition was unknown and the placement of the end of the maze was also arbitrary, Pac-man and Ghost required a unique maze-solving algorithm. Algorithms that mapped a maze or utilized existing knowledge of a maze's end would not work for us. Instead, we used the Pledge Algorithm, which specialized in obstacle avoidance by employing a counter based system. This algorithm, programmed with C, allowed our robots to have a sense of their orientation within the maze. However, to ensure the speediest finish, Pac-man also implemented a beacon sensor to communicate with the beacon placed over the end of the maze. If Pac-man were in close proximity to this beacon, it would override the Pledge algorithm to prevent it from turning away from the end. 3. With only a budget of $100, we had to get creative with our choices along the way. We purchased a line-following IR sensor with the original intention of using it as part of the robot’s maze navigation. However, with the use of Pledge this was not necessary. Instead, we repurposed the line-following IR, which detected contrast in the floor, to help Pac-Man find the end of the maze. We could set a threshold for when the robot was or was not situated on a black surface. Once the sensor value surpassed the “black” threshold, Pac-Man would know it had rolled over the yellow-paper that marked the finish. This simple change ended up being one of our most innovative uses of sensors.